MORGANTOWN, W.Va.– Blue, gold, white and grey: WVU unveiled new football uniforms at halftime of its spring game Saturday. The jerseys aren’t a radical change from the past, other than the addition of a grey option, though they do contain a new font. As far as the helmets, there is no longer a gold version, as blue and white ones are the only helmets that will be used on game days. The objective of the uniform design, which has been two years in the making, is far greater than just new uniforms for the Mountaineers’ 18 varsity sports. The process brings a consistent and unified look across the athletic department and provides staff, corporate partners and suppliers with helpful guidelines to support the WVU athletic brand across a wide range of applications and media. To accompany the iconic Flying WV logo, the GIG process created an exclusive numeral style, wordmarks, color palette, special typography and fonts as well as extended expressions including treatments, patterns and textures solely for WVU Athletics. These new and dynamic elements will allow the athletics department to be creative and flexible across all types of media and provide a look that is solely identified to West Virginia’s team – the Mountaineers. At today’s Gold-Blue-Spring Game, the first element of the Nike GIG process was unveiled with new football uniforms. Other new West Virginia uniforms, including men’s and women’s basketball, will be revealed in the coming months. 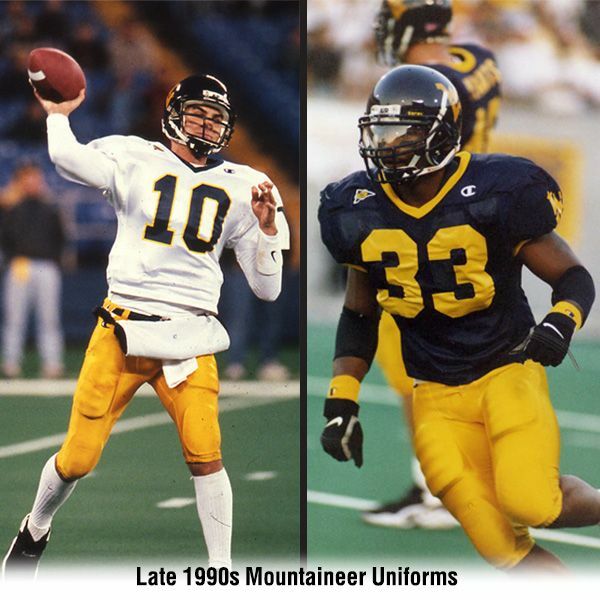 West Virginia will return to four colors of jerseys and pants for the 2019 campaign after spending the past six seasons using three colors of jerseys and pants. Rejoining blue, gold and white in the color scheme are a gray jersey and pant, which last appeared in game action in 2012. The 2019 version for football will be Nike’s Steel Gray and is a tribute to the toughness of the hard-working people in the state of West Virginia and the strength that all Mountaineers possess. Not counting the color of multiple helmets in the equation, the Mountaineers will have the option of 16 different uniform combinations. The number greatly increases to 48 different uniform combinations when the three helmet colors are factored into the uniform set. More information about WVU’s GIG process and a look at color palettes, fonts, wordmarks, numeral styles and typography along with a complete video and photo gallery of today’s football uniform reveal can be found on WVUsports.com/nike.